It has been brought to my attention that Seneca Ranch and Magnolia Christian school (possibly among others) are linking to this site in an attempt to bolster their credibility by pointing out (accurately) that Sue Scheff is a competitor, and not truly neutral advocate. While this may be true that Sue Scheff has said things about these places for the wrong reasons, that does not make the things she has said false. A few years back, Sue Scheff was sued by the WWASP series of schools in part for defamation and in part for unfair competition under the Lanham act. In that case, the transcript of which is available in the sidebar under WWASP vs. PURE, it was found that while Sue Scheff did have her own agenda, and was being paid by programs for her referrals, she was nevertheless telling the truth about WWASP’s treatment of children. Because it was found that the statements she made about these schools were not false, the case fell apart. Therefore, if Sue Scheff has said things about these two schools, I would tend to believe her, even though I would not trust her for a second to refer a child to a program. I would like to emphasize to parents that while there may indeed be safe programs out there, history has taught us that it has been impossible to effectively tell a bad program from a good one. Because this is effectively impossible, it is therefore unsafe to place in any program. That may sound like an extreme or alarmist statement, but having studied this industry from it’s origins to it’s current state, I can assure you it is not. Back in the 80s, a program known as Straight Inc. was considered to be the best program out there for troubled teens. Endorsed by Nancy Reagan, Princess Diana, George HW Bush, and others, it was seemingly beyond reproach. Yet, ten years later, that same series of programs was revealed by lawsuits and state investigations to be one of the most abusive places ever to exist. Around the same time the CEDU chain of schools were likewise considered to be above reproach, and likewise, when the program was shut down and the dust settled, abuse was found. I could go on and on with examples, even to the present day, but the point is that you cannot trust marketing, you cannot trust “advocates”, and you cannot trust educational consultants, for whom it is legal to take “kickbacks” for referrals. If you have a child who is misbehaving at home and it seems like you’ve exhausted all your options, I would urge you to keep looking for at-home options before you risk your child’s health and sanity by sending them to a program that may or not be abusive. Don’t trust anybody who says they know “safe” places for kids. The fact is it’s just not worth the risk. The complaint alleges that some students enrolled at the Whitmore Academy were physically bound with plastic handcuffs for several hours, others were forced to spend periods of time outside without any clothing on, and some were forced to sleep in a space referred to as the “shelf room.” The shelf room was a small, enclosed area where students could neither sit up, fully stretch out, and was located 10 feet off the ground, according to the complaint. The Sudweeks were also accused of recruiting students and encouraging the students to use violence against other youths to enforce the rules. … In September of 2006, Cheryl Sudweeks pleaded no contest to four class C misdemeanor counts of hazing and agreed to meet all court-ordered requirements and pay a fee. In April, Gregory Kutz, the Government Accountability Office’s managing director of Forensic Audits and Special Investigations, used several examples of problems at the Whitmore Academy and other behavior modification schools to show that boot camp therapy companies use deceptive practices enrolling troubled teens in programs where they can end up abused and neglected. 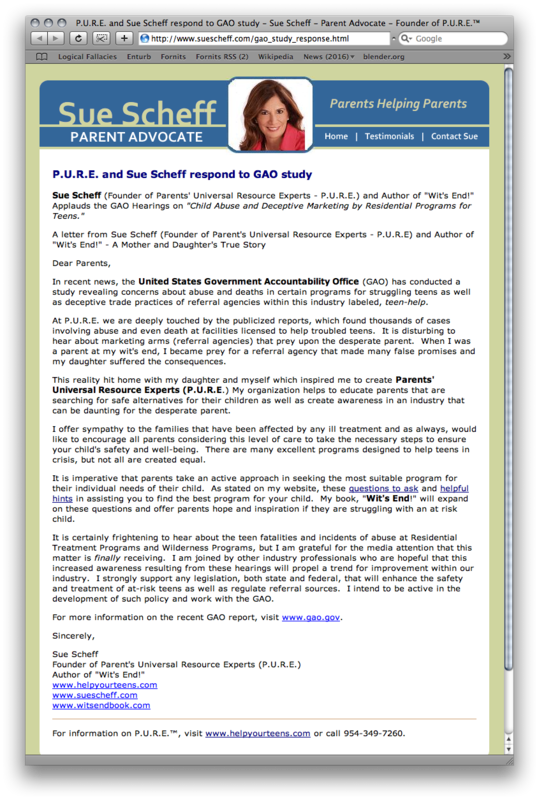 Readers of this blog might find irony in the fact that Sue Scheff is praising (archive) the GAO’s investigation of abuse in programs considering that, in their report, they detail abuse that occurred in a prominent program she referred to, Whitmore Academy, run by Mark and Cheryl Sudweeks. Although the facility and it’s owners are not named, specifically in the report itself, Greg Kurtz, of the GAO, revealed during a congressional hearing’s Q&A session that Case 7 of abuse was, indeed, Whitmore Academy. 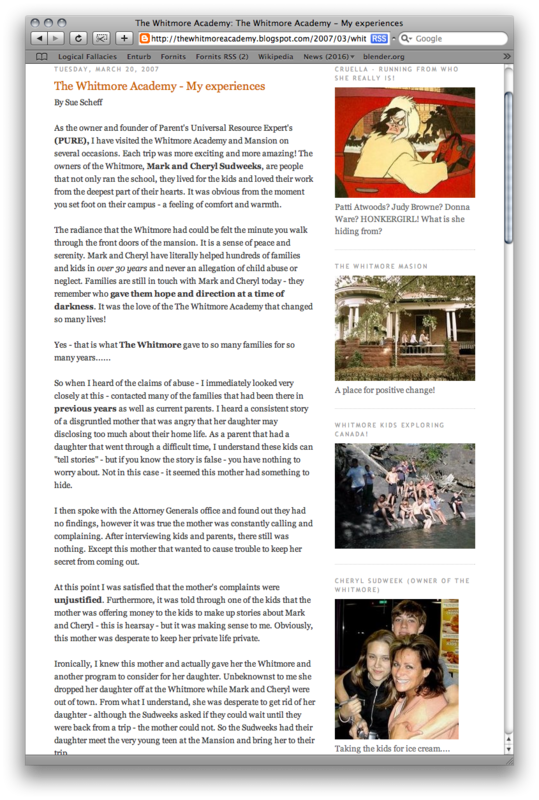 As if referring to Whitmore when parents had already informed her of abuse and a criminal investigation wasn’t bad enough, Sue Scheff continues to defend (archive) Whitmore Academy. Instead of taking responsibility for her actions, however, Sue Scheff resorted to defaming the very parent who tried to warn her of the abuse, a pattern of behavior that seems to be systemic against her critics, with targets including this very blogger. Harbor Oaks is a Christian boarding school located in Mars Hill, North Carolina. The owners are James and Patricia Jones. The facility uses the Accelerated Christian Education (A.C.E.) workbook curriculum provided by School of Tomorrow. School of Tomorrow requries that just one person in an entire school be “certified” to use the curriculum. However, this certification is NOT from any state agency. It is issued by School of Tomorrow. This enables schools to use the curriculum without having any certified teachers.The status of the “teachers” at Harbor Oaks is still in question. ISAC has received complaints against Harbor Oaks alleging inadequate education, false advertising, unqualified staff, lack of supervision, and physical abuse. Sue Scheff, owner of Parents Universal Resource Experts (PURE), reportedly receives payment in exchange for referring families to Harbor Oaks. How a ‘child advocate’ gamed the media Republished From Reason Magazine with Permission of the author. Original here. Maia’s Huffington Post comment on this article here. Maia Szalavitz | August 24, 2007 Sue Scheff has some serious chutzpah. Portrayed by ABC News, the Washington Post, the Wall Street Journal and Forbes as a beleaguered mom running a small business to help parents find treatment for troubled teens, Scheff’s been telling reporters about a service called Reputation Defender, which she says allowed her to triumph over a bunch of rage-filled Internet cranks. Scheff says these vengeance-seeking wackos nearly destroyed her, an innocent businesswoman, with a series of libelous comments posted on online discussion boards. They had called her a “fraud” and “con artist,” she says, and claimed that she was referring teens to tough love programs that then abused them. What none of this media coverage mentions is that a few years back, Scheff was sued for the same types of comments now directed at her—highlighting the abuses of a “tough love” rehab center (in this case, one of Scheff’s rivals). At the time, she framed the suit against her as an attempt to squelch her free speech. (continued from previous entry) Soon after Sandy realized what Izzy was up to, “V” started to figure things out as well. According to “V”, It is during this time that Isabelle advises “V” to stop reading or posting on Fornits. “V” then started to catch on to what was going on, and forwarded me her correspondence with Isabelle. Soon after, Isabelle Zehnder, apparently started to realize that referring parents to Fornits was not the best idea in the world. One would suspect, based on her next move, that she sensed the upcoming disaster. I couldn’t have been more surprised when i answered my cell phone to hear “this is Isabelle Zehnder.” My first words to her were along the lines of “may I record this call? I normally wouldn’t ask, but Washington is a two party state.” She refused, so I decided to play dumb and take notes. Her first subject of conversation was Patti Atwoods. She proceeded to lie about various details that I could verify as fact. Her basic explanation was that she was “set up”; that she was threatened into referring to sue (or else the kid would end up in Cross Creek Manor). Notice she claims competance when it suits her. In contrast, when I questioned her about the unlicenced, WWASP associated transport service, she responded with “Well… I had no idea”. I questioned Isabelle as to whether she investigated the facilities Sue Scheff referred to. She responded that she only investigated facilities in which there had been allegations of abuse, apparently unlike “[she] always do[es]”. Isabelle Zehnder then claimed that the transport company was only supposed to be used to remove the child from Tranqility bay, and not to transport to a new program. I found that more than a little absurd considering her final email to Patti seemed to contradict those clams (ie. Isabelle referred Patti Atwoods to PURE, for the purpose of finding a placement for the child after Tranquility Bay. One can only assume that a transport company would be required for this move). When I began to question her association with Sue Scheff, PURE, and whether or not she had any knowledge of her Sue Scheff’s activities, she claimed that she was completely ignorant. Isabelle claimed to never have fully read the WWASP vs PURE transcripts, just the first 400 pages. She acted shocked as I read to her page after page of Sue Scheff’s own admission under oath that she took referral fees from programs. She claimed that nobody had taken the time to calmly explain the situation to her. Several days later, I talked with Isabelle on the phone again. This time I was much more direct. I stated that if she wanted to save herself she would have to start handing over some solid intel regarding Sue Scheff and the schools she refers to. After hesitating, she gave me the name of Harbor Oaks. She claimed to have helped remove a girl from Carolina Springs, and helped place that girl in Harbor Oaks. This time, however, Isabelle claimed to have done her “investigation” (like she “always” does) This thorough investigation consisted of a telephone call to Harbor Oaks in which she spoke with two girls. She reported that they sounded very happy to be placed in Harbor Oaks and that she could actually hear the laughter of children in the background. She claimed the phone call was completely unmonitored (how could she tell over the phone) even though the Harbor Oaks contract (obtained by sueschefftruth.com by a source who wishes to remain anonymous) explicitly states that all phone calls and mail will be monitored. When I raised objections, and spoke of my own personal experiences regarding elaborate program deceptions, she changed the subject, telling me that the “kids (plural) needed help”. Although with the recent publicity and rumors surrounding Sue Scheff have apparantly provoked Isabelle Zehnder of CAICA to distance herself, the relationship between the two in the past has been well documented, including in the words of Zehnder and Scheff themselves. Like Sue Scheff, on the surface, Isabelle Zenhder appears to be a legitimate advocate. Her website includes comprehensive information about the dangers of programs. “I have read claims, Blogs, and horrific postings about my organization and myself being served a lawsuit – this is not true. Neither myself nor the other defendants listed on what they are posting have received any such lawsuit. If there is a lawsuit, we certainly don’t know about it and you would think the defendants should have it?